Help Preschool, Kindergarten, and 1st grade kids practice discriminating between different coins with this fun Color the Coins Money Worksheets. Help kids learn to recognize American money: half dollar, quarter, dime, nickel, and penny. These fun money worksheets are great for coin recognition for Preschool, Kindergarten, and 1st grade kids. 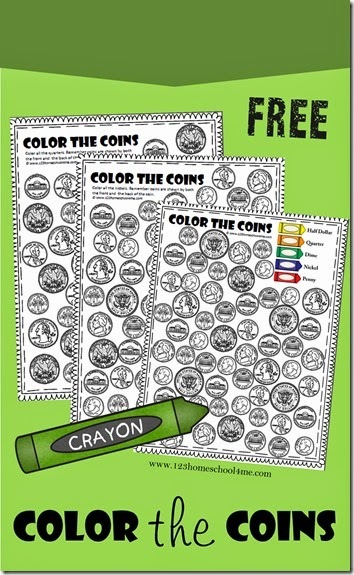 Just print the money worksheets and color to practice recognizing coins. To mix it up your child could place pretend coins on top of the coins instead. They are various worksheets to help kids learn to identify by sides of half dollars, quarters, dimes, nickels, pennies, and all of them together.